The consequences of improperly disposed garbage can be far reaching. Beyond the unsightly appearance, littering can affect in ways you least expect, like marine wildlife, terrestrial animals and even birds. Yes, even the feathered creatures that barely set foot on the ground cannot escape the threat of garbage. Birds build their nest from loose debris and other material they can find. They do not sort out what they are taking with them, as long as it is good enough to build their home. 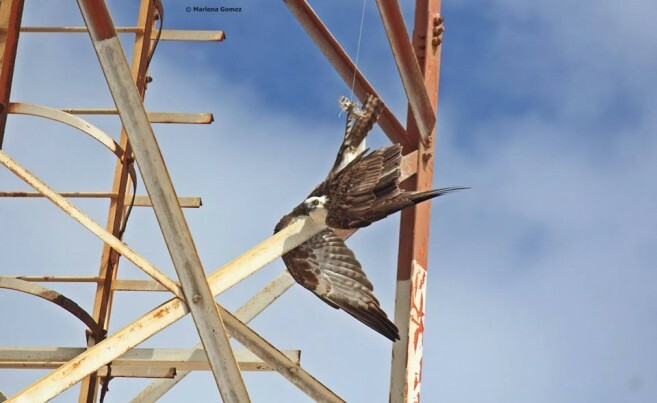 An osprey family that built its nest on the very top of a BEL tower never imagined that its offspring almost did not make it when it was ready to leave the nest. 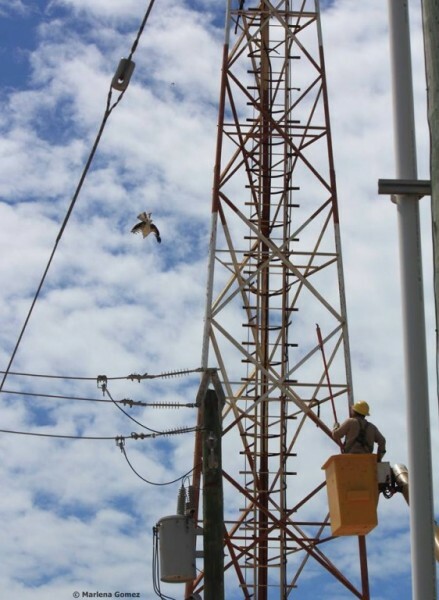 According to Chris Summers from the American Crocodile Education Sanctuary (ACES), he had just returned from the San Mateo area, after setting a small croc trap, when he became involved with the Belize Electricity Limited (BEL) crew in the rescuing of a juvenile osprey. 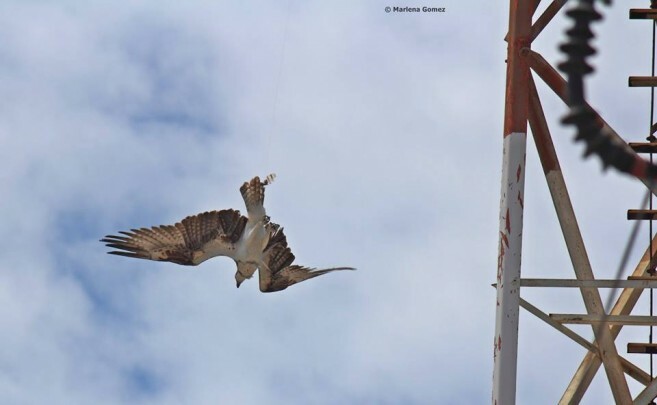 The bird was tangled on some fishing line that was dangling from its nest. 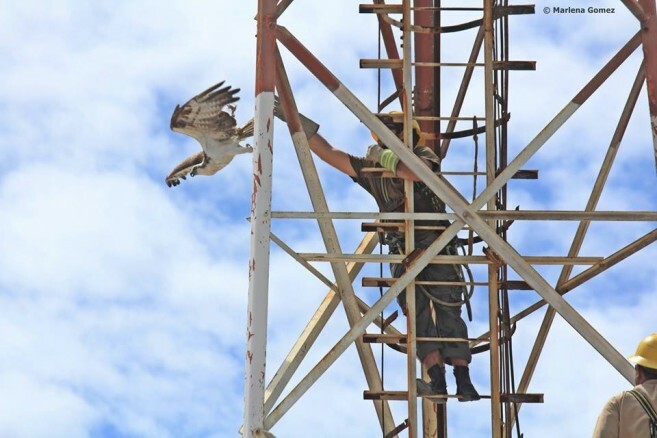 With assistance from the BEL crew and their safety gear, Chris made his way up the tower where he met with the agitated osprey. After inspecting the line, no hooks were noticed, and the line was quickly and easily untied. 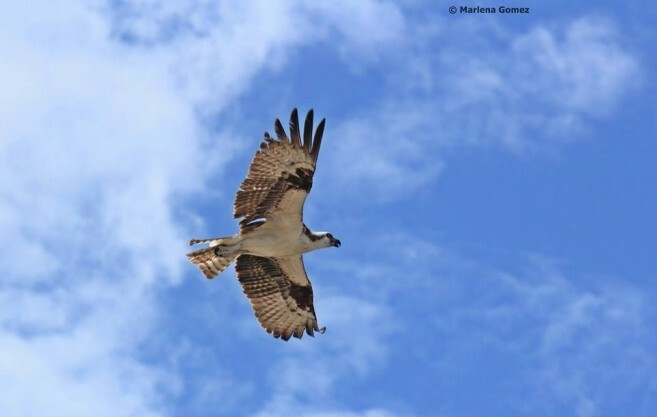 “After the osprey was released, he flew off quite happily to go do what birds do!” said Chris. The island continues to struggle with its garbage issue and according to The San Pedro Town Council they are doing as much as they can to fight the terrible eyesores in many parts of the island. It is a known fact that irresponsible disposal of garbage affects far more than our aesthetic. Defenceless creatures can find themselves entangled in human generated trash as well. Let’s put garbage in its place! A clean island is a healthy environment and a safer habitat for us and our wildlife, both on land and in the sea. For any wildlife emergencies, ACES / American Crocodile Education Sanctuary can be reached anytime on 623- 7920. 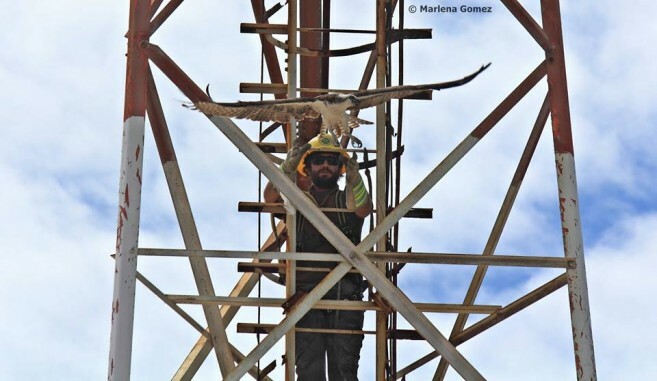 Kudos to everyone involved in the rescue of our feathered friend, and thank you Marlena Gomez for taking the amazing photos!